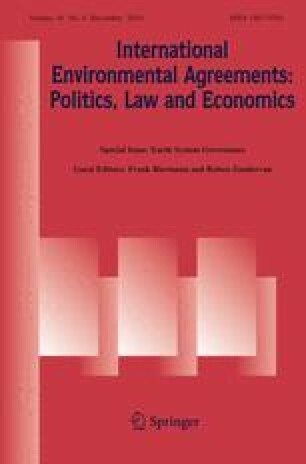 This article examines the agency of indigenous peoples in designing a mechanism for reducing emissions from deforestation and forest degradation (REDD) under the emerging post-2012 agreement to the United Nations Framework Convention on Climate Change. It investigates whether indigenous peoples have agency in international negotiations and specifically the REDD design process and if so, how they have obtained it. Agency refers to the ability of actors to prescribe behaviour and to substantively participate in and/or set their own rules related to the interactions between humans and their natural environment. The aim of this study is to gain understanding of what role non-nation state actors, particularly indigenous peoples, play in shaping the REDD design process under the climate convention and what is shaping their agency. A special emphasis is placed on indigenous peoples as they may be highly vulnerable to the impacts from both climate change and certain policy responses. The article finds that, through REDD, indigenous peoples and forest community alliances are emerging in the climate regime but their agency in designing a mechanism on forest protection in a post-2012 climate regime remains indirect and weak. They are being consulted and invited to provide input, but they are not able to directly participate and ensure that their views and concerns are reflected in the outcome on REDD. I am grateful to the Tyndall Centre for Climate Change Research Oxford and the Oxford Martin School for funding. I thank Przemyslaw Zelazowski, Constance McDermott, two anonymous reviewers as well as Frank Biermann and Ruben Zondervan for their very useful and critical comments on earlier versions of this article. Adger, N. W. (2006). The political economy of cross-scale networks in resource co-management. Ecology and Society, 10, article 9. (http://www.ecologyandsociety.org/vol10/iss2/art9). Cash, D. W., Adger, W. N., Berkes, F., Garden, P., Lebel, L., Olsson, P., Pritchard, L., & Young, O. (2006). Scale and cross-scale dynamics: Governance and information in a multilevel world. Ecology and Society, 11, Article 8. (http://www.ecologyandsociety.org/vol11/iss2/art8/). Chagos, T. (2009). Non-state actors and REDD. Issues surrounding the participation of indigenous peoples and local communities. Climate focus North America memo [online: http://www.redd-oar.org/links/Legal%20Issues%20REDD.pdf. FOE.(2009). Views on issues relating to indigenous peoples and local communities for the development and application of methodologies. Submission from Friends of the Earth International 15 February 2009 to the UNFCCC. Available at: http://unfccc.int/resource/docs/2009/smsn/ngo/105.pdf. UNFCCC—United Nations. Framework Convention on Climate Change (2004). UNFCCC Statement, International day of the world’s indigenous peoples. Available at http://unfccc.int/files/press/news_room/statements/application/pdf/statem040809.pdf. Hatcher, J., & Bailey, L. (2009). Tropical forest tenure assessment: Trends, challenges and opportunities. RRI & ITTO Report. Yokohama: ITTO. Available at: http://www.rightsandresources.files.wordpress.com. Accessed June 20, 2009. IGES (2009). IGES CDM Project Database, updated October 1 2009. Available at: http://www.iges.or.jp/en/cdm/report_cdm.html. Lawlor, K., & Huberman, D. (2009). Reduced emissions from deforestation and forest degradation (REDD) and human rights. (In J. Campese, T. Sunderland, T. Greiber, & G. Oviedo (Eds. ), Rights-based approaches: Exploring issues and opportunities for conservation. (Bogor, Indonesia: CIFOR and IUCN.) Available at http://data.iucn.org/dbtw-wpd/edocs/2009-014.pdf. Mother Earth Journal (2009). The fallout at Copenhagen for indigenous peoples: What happened? What didn’t? Available at: http://mother-earth-journal.com/2009/12/the-fallout-at-copenhagen-for-indigenous-peoples-what-happened-what-didnt/. UNFCCC. (2006). UNFCCC Statement, International day of the world’s indigenous peoples. Available at http://unfccc.int/files/press/news_room/statements/application/pdf/ 20060808_rk_indigenous.pdf. UNFCCC. (2008) Reducing emissions from deforestation in developing countries: approaches to stimulate action. Draft conclusions proposed by the chair. FCCC/SBSTA/2008/L.23. Available at http://unfccc.int/resource/docs/2008/sbsta/eng/l23.pdf. UNFCCC. (2009a). Issues relating to indigenous people and local communities for the development and application of methodologies. Submission by the Czech Republic on behalf of the European Community and its member states. FCCC/SBSTA/2009/MISC.1. Available at http://unfccc.int/resource/docs/2009/sbsta/eng/misc01.pdf. UNFCCC. (2009b) Reducing emissions from deforestation in developing countries: approaches to stimulate action. Draft conclusions proposed by the chair. Addendum. FCCC/SBSTA/2009/L.19/Add.1. Available at http://unfccc.int/resource/docs/2009/sbsta/eng/l19a01.pdf. UNFCCC. (2009c) Reordering and consolidation of the text in the revised negotiating text. Note by the secretariat. FCCC/AWGLCA/2009/INF.2. Available at http://unfccc.int/resource/docs/2009/awglca7/eng/inf02.pdf.